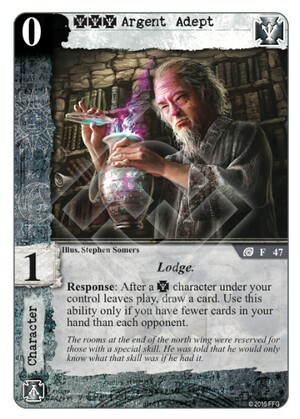 Flavor Text: The rooms at the end of the north wing was reserved for those with a special skill. He was told that he would only know what that skill was if he had it. Less impactful in dual faction decks, i.e. the more powerful ones. You'll have to subsequently draw at least 3 cards from your self-bouncers (Initiate of Huang Hun, Knight of Outer Void, Farrington) to get ROI after playing one of these and the limitation to the opponent's hand size annihilates the card advantage potential. 2/5. The Adept's ability is just gravy. Run him for his 0-cost, which is big league when combined with cards like H.O.S.T., Garden District, and so on.